In the fall of 2002, I was sitting in a common area at my undergraduate alma mater, William Jewell College. I was entering my second year of college and all was well but I was contemplating reenlisting in the US Army. I had joined after high school and served for 5 years. While I really enjoyed college, I was ultimately unsure what my career would be. As I was sitting there determining my next move in life, I was presented with a crossroads in the form of my spectacled undergraduate advisor who asked, “Do you want to go to Puerto Rico this summer and study litter microarthropods?” Admittedly, I only heard the first half of that sentence. But it was this simple interaction and the summer research trip that followed which changed the course of my life and brought the amazing world of soil to light. It was made all the more remarkable by the fact that I was collecting live soil microarthropods, spending hours in front of a scope, or on my hands and knees with my nose inches from the soil surface (see video below). It was during these episodes that I came to realize the tenacity of pseudoscorpians, the nervousness of collembola, and the slow methodical movements of orabatid box mites. The culmination of efforts spent meticulously picking small microarthropods was to manipulate community structure, altering species interactions, and observe its effect on litter decomposition rates. I collected some data and the results were interesting but the combination of a tropical storm and graduate school preparation distracted me from ever wrapping up this project. All was not lost though; in grad school I was exposed to a whole new level of diversity in soil: microbial diversity. While not as exciting with regards to direct observation, the diversity of function between communities was astounding. I was able to demonstrate how microbial function differed between communities and the role that resource legacies play in those differences. Yet, I was still fascinated by how interactions might shape these communities and their function, as I had expected it to shape microarthropod community function in Puerto Rico. In my mind I was envisioning competitive antibiotic battles and coordinated release of extracellular enzymes driven by quorum sensing (see image to the right). In fact, my lab recently explored the role of quorum sensing in litter decomposition. We found that inhibiting quorum sensing led to decreased decomposition but only when the litter was chemically complex. When the litter was chemically simple, the role of quorum sensing was negligible. This may mean that this facilitative interaction is more important when resources are limited, or at least require more costly enzymes to degrade. 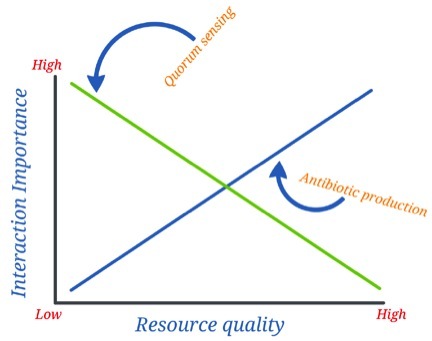 When resources are abundant then, does this mean that competitive interactions dominate? Ecological theory predicts this possibility but definitive proof is circumstantial. Now, I’ve returned to my earlier interest in soil microarthropods while continuing my exploration of soil microbial communities. My lab is now beginning to understand the interactions between these often separately studied groups. We’re just in the initial stages but have found that some combinations of microarthropods suppress microbial decomposition (see image bottom left). 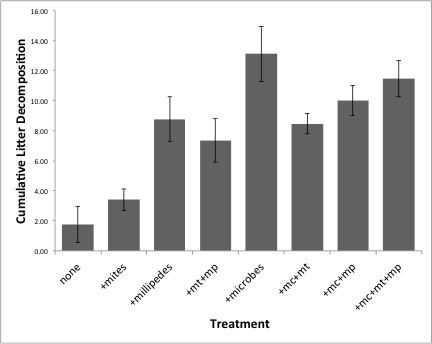 We’ve also found that, not surprisingly, microarthropods inoculate their habitat with microbes. This raises interesting possibilities concerning whether or not there are facilitative interactions between microarthropods and the microbes they disperse and whether or not co-occurrence between these two groups is generally negative or positive (a sort of microbe-microarthropod feedback). Next we hope to introduce microarthropod predators into the mix and examine their effect on ecosystem processes. Yet, why stop there? Why not also begin to examine how changes in species interactions aboveground influence those belowground and vice versa? I’ve been involved in work recently that illustrates one side of this interaction. That is how changes in the trophic structure of aboveground communities can have a marked influence on the function of belowground communities. What about the other side? There are indications that it happens. For example, the presence of predators alters the distribution of earthworms in the soil profile leading to changes in plant nutrient availability. This has obvious implications for aboveground communities. Yet, we often study aboveground and belowground communities in isolation and speculate on how they might affect each other. We need to mechanistically understand the interactions between the worlds above and beneath our feet. So to sum it all up, interactions are important from simple meetings that change the outcome of careers to trophic cascades and interspecific competition that can change the outcome of litter decomposition. This isn’t a radical thought and many are exploring the role of interactions in soil (see Felicity Crotty’s blog from October 21st). But, I think that it’s the interactions in these communities and across communities, particularly above- and belowground, that bring their diversity to life and are likely to shed light on the role of these organisms with regards to ecosystem processes.